Do You Feel Constantly Tired & Stressed? You may be one of the many people suffering from Adrenal Fatigue Syndrome. This widespread condition usually results from chronic stress, and it leads to symptoms like fatigue, food cravings, a weakened immune system, and much more. Follow this program to restore your energy levels, the natural way. We'll Refund Your Money, No Questions Asked. This treatment plan comes in several downloadable ebooks (in PDF format), audio files, and a video course. Please note that no physical product will be shipped to you. It is fully compatible with PCs, Macs, iPads, Android tablets and many other computers and mobile devices. If you have any problems downloading the treatment plan, just contact us here and we will be happy to help you. The program contains all the information you need to recover your energy levels, the natural way. Learn how to restore your vitality by following the right diet, managing your stress, and using the correct supplements. The program includes valuable tools and recipes that will guide you all the way through your recovery process. We are also including the following three bonuses for FREE when you purchase the program. 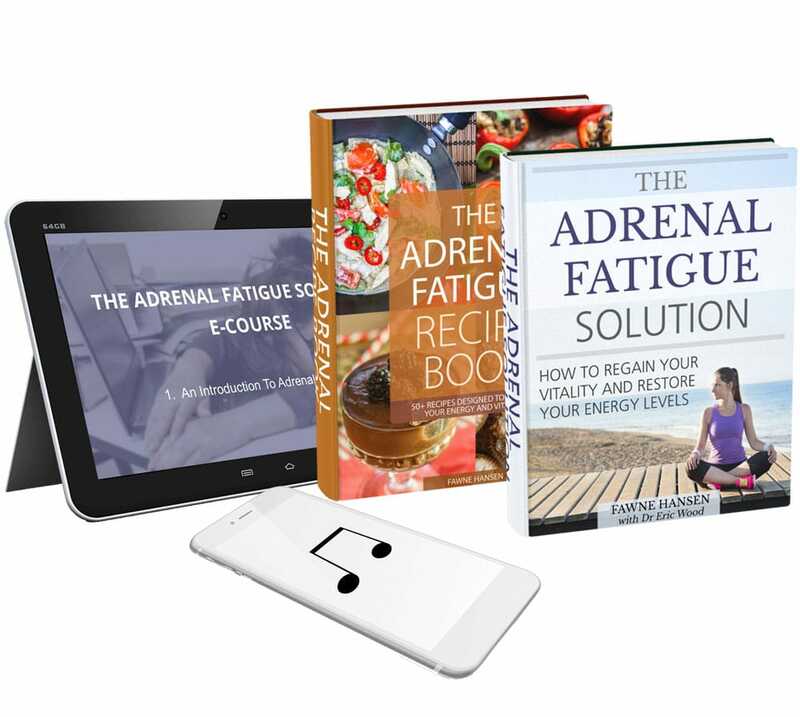 These bonus materials are only available here with The Adrenal Fatigue Solution. Watch them on any device, at any time. You'll have access to them forever. Over 2 hours of guided meditations, designed to help you relax and lower your stress levels. Listen to them on your phone, digital music player, or computer. You'll have access to them forever. 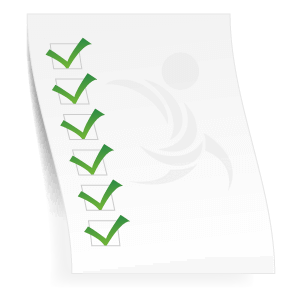 Detailed shopping lists to help you choose foods that will support your energy levels, not lower them. Worksheets to help you identify your stressors, recognize your symptoms, and track your recovery. 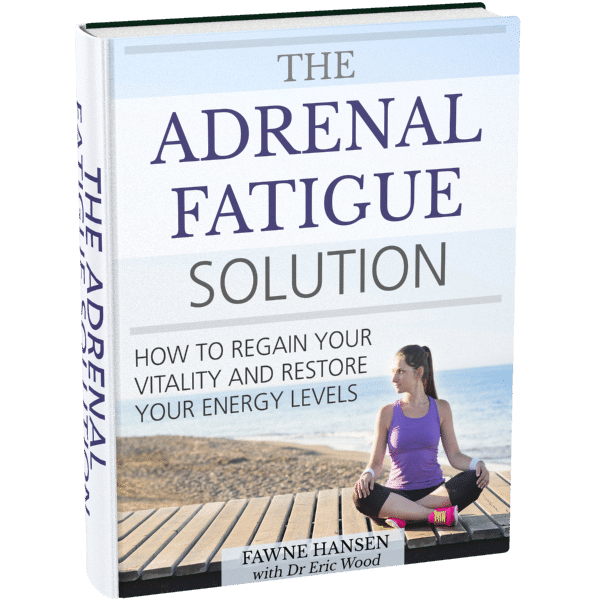 Christine R. says…"If you are interested in learning about adrenal fatigue and to find out if you have it, I highly recommend The Adrenal Fatigue Solution by Fawne Hansen and Dr. Eric Wood. It is an excellent, thorough book about this widespread condition that doctors just aren't treating. This book shows you how to heal your adrenal fatigue for good." Chris A. says…"You don't know how much I appreciate your new book, The Adrenal Fatigue Solution. I have been undergoing unrelenting stress for 7 years. I haven't understood why I cry, have so little energy, and am irritable all the time. Now I do, and I know how to cope. Your selfless efforts in gathering this book's information are so generous. Thank you and God bless you. I love you for your help." Justine M. says…"Your ebook is very well written and helpful - a perfect balance between scientific facts (giving readers a chance to fully understand this condition) and easy-to-read tips on how to regain vitality. With so little information out there about adrenal fatigue, I found it very useful and really enjoyed reading it." Are you experiencing any of these stress-related symptoms? Did you know that all of these can be caused by the under-functioning of your adrenal glands and endocrine system? You might be one of millions of people who have experienced stress or trauma, and who are now suffering from a condition named Adrenal Fatigue Syndrome. Adrenal Fatigue Syndrome can cause all of the symptoms listed above, and it is becoming more and more prevalent in our over-stressed modern society. We call it a syndrome because it usually occurs as a collection of individual symptoms. Any of these symptoms, taken by themselves, might point to an alternate illness, but taken together they clearly suggest Adrenal Fatigue. Adrenal Fatigue Syndrome is a group of diverse symptoms that present due to the under-functioning and depletion of key neurotransmitters and hormones produced by the adrenal glands, HPA axis, thyroid gland, and often reproductive glands. As you can see, Adrenal Fatigue is much more complicated than simply 'tired adrenal glands'. But here's the good news. Taking the first steps towards better health is relatively easy. Make a few simple adjustments to your diet and lifestyle, and you could start to feel better within weeks. So how widespread is Adrenal Fatigue Syndrome? Some practitioners believe as many as two-thirds of Americans have suffered from some degree of adrenal exhaustion. But while some of us can bounce back relatively quickly from a period of stress or trauma, others find it more difficult. Left untreated, Adrenal Fatigue can gradually worsen until simple everyday tasks become a challenge. That's why it is important to address the cause of your Adrenal Fatigue early, and begin a restorative treatment to rebuild your health, vitality and energy levels. Have you spoken to your regular doctor? Adrenal Fatigue is a syndrome, meaning that it encompasses multiple systems and aspects of your health. This also makes it a very difficult condition to diagnose for a typical MD, whose training is typically focused on more acute conditions. In other words, MDs are great when you have an acute condition that sends you to hospital, but they're not so helpful when faced with multiple symptoms and general complaints of feeling 'tired and unwell'. Did you know that MDs receive less than one day of nutrition training during their entire 4 years at medical school? A 2006 study found that the average MD received only 23.9 hours on this vitally important subject. Modern healthcare has drifted away from promoting things like nutrition, emotional wellness, and exercise, and has become almost exclusively focused on treating acute, life-threatening conditions. Again, that's not so helpful if you are suffering from a condition like Adrenal Fatigue. There are other reasons why doctors (and even some naturopaths) are unable to make a diagnosis of Adrenal Fatigue. The requisite lab tests are rarely covered by insurance, and are often difficult to interpret for an inexperienced doctor. It takes a skilled and experienced practitioner to determine what your 'optimal' ranges should be, rather than the wide 'normal' ranges suggested by the lab. Treating Adrenal Fatigue requires lifestyle changes, for example an improved diet and exercise routine, along with appropriate supplementation and even some emotional counseling. Even if your MD is willing to go through these steps with you, the limitations of our overcrowded healthcare system make it impossible for him or her to do so. Modern healthcare aims to get patients in and out of the clinic as quickly as possible, and it encourages the use of prescription medicines to treat symptoms, rather than attempting to diagnose and treat the underlying problem. Adrenal Fatigue Syndrome is a very real condition, but navigating your way through all the treatment options can be difficult. Individuals with Adrenal Fatigue tend to bounce between family doctors, endocrinologists, psychotherapists and more. They are often prescribed drugs like sleeping pills and antidepressants by well-meaning doctors who simply can't figure out what is wrong with them. But the truth is that treating Adrenal Fatigue involves much more than prescribing drugs. It requires a combination of experience and knowledge of both conventional and alternative medicine. An integrative approach, combining conventional and alternative medicine, is ideal for a condition like Adrenal Fatigue Syndrome. Integrative medicine combines the best of these two disciplines, emphasizing holistic treatment rather than just zeroing in on a single symptom. This means focusing more on things like prevention, diet and lifestyle choices, and less on prescription drugs that simply act as 'band-aids' for your condition. The right lifestyle adjustments, like improvements to your diet or proven stress reduction techniques, can have an enormous impact on those who suffer from Adrenal Fatigue. 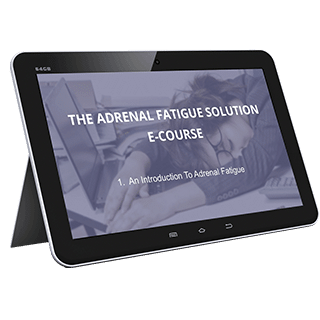 In The Adrenal Fatigue Solution, we have included everything you need to know about diet, stress management, exercise, supplementation, hormone replacement and much more. It gives you all the tools you need to get the right tests, identify what might be causing your fatigue, and begin restoring your energy levels one step at a time. You will also learn how to prevent your Adrenal Fatigue from reoccuring. Full recovery may take some time, but once you start on the right path you should begin to see your energy levels improving within weeks. Gay R. says…"The book is fabulous. So well executed and organized into all the environmental and societal influences contributing to Adrenal Fatigue. I think it should be a continuing education module for RDs, Nurses, and physicians." Beth R. says…"I just finished reading this incredibly comprehensive, clear, and helpful book on adrenal fatigue. 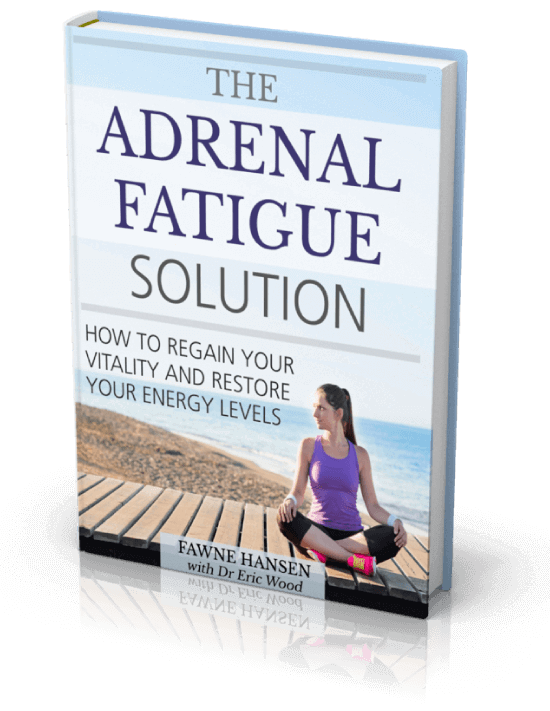 Highly, highly recommended: The Adrenal Fatigue Solution." Karin B. says…"Before I read The Adrenal Fatigue Solution, I was pretty depressed—I was still sluggish and still struggling with this weight gain and still needing my supplements. Now I'm hopeful—I see how I've been exercising wrong for my energy level, and how my diet has been fighting against my supplements. Not all of these changes are going to be easy, but now I know how I can start to improve my own health. It's so encouraging to know that I have more control than I realized!" What does The Adrenal Fatigue Solution contain? The Adrenal Fatigue Solution contains everything you need to start treating your Adrenal Fatigue. We have included lots of information on the lifestyle changes that you should be making, along with complete lists of the vitamins, minerals and supplements that you should be discussing with your doctor. The eBook is written in simple, easy-to-understand terms, and is the perfect starting point for your treatment. The 9 causes of Adrenal Fatigue, including poor diet, sedentary lifestyles, hormonal decline, physical trauma and much more. Fawne Hansen is an author and wellness coach specializing in the treatment of chronic stress and adrenal fatigue. 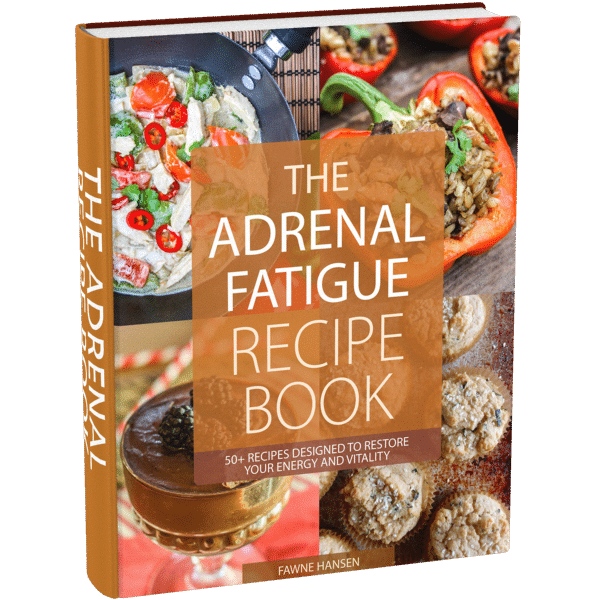 This book includes much of the knowledge that Fawne gleaned from research into her own Adrenal Fatigue, in addition to countless discussions with doctors and naturopaths. The eBook also contains many of the strategies that she used to recover her health and vitality, along with the knowledge gained from real-life experiences of other Adrenal Fatigue sufferers that she has helped.